The Zohar, Chapter “Yitro (Jethro),” Item 180: …We should look at the forms of people in six discernments, and to know wisdom thoroughly. Those are the hair, eyes, nose, lips, face, and hands, meaning the lines in the hands. 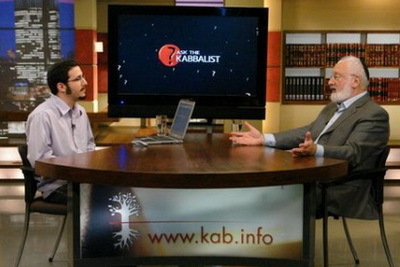 The science of Kabbalah explains all the spiritual qualities using earthly words. That’s because there are no words or letters in the spiritual world, but only sensation, attainment, and understanding. Therefore, we don’t have any other way to express and convey spiritual information and impressions from one person to another. That is why we take words from our world because our world, this earthly reality, is an imprint of the upper reality and everything existing in our world has roots in the spiritual world. Therefore, when The Zohar talks about the features of a person’s face, his internal organs, or parts of the body, all of this is describing the corresponding forces acting in spiritual space, meaning between souls, inside of their connection. In this way, using “the language of branches,” we convey information about the spiritual world to one another. This can be compared to electrical forces by which we create an image on a computer screen. Inside the computer there are electrical forces, but for us we use them to depict images we understand. We can talk about inner electric forces using their external results: graphical terms, colors, and geometric figures. We can name these electrical forces by their graphical images, even though they are not colors, lines, or images. It’s just that in the external manifestation they create these forms for us and we use the names of these forms to name these forces. Therefore we have to understand that the authors of The Zohar did not engage in physio-mysticism, physiology, or other such things, but wished to describe the inner structure of the soul in detail. A person who is in the spiritual world envisions everything written in The Zohar in the spiritual sense, knowing that it is talking about spirituality. He sees this because the spiritual impression is much more powerful than the earthly one. Therefore, he observes the spiritual picture before anything else. On the other hand, a person who is only in the material world and for now perceives only the earthy reality on his screen, sees earthly images behind The Zohar’s words. So while reading The Zohar, let’s try to go from one screen to the other, from the external screen on which earthly images are depicted for us, to the soul’s inner structure. Let us try to imagine the qualities of the soul. And even though we do not understand what The Zohar is talking about, our efforts evoke the Light that corrects us. Baal HaSulam writes the following in “Introduction to Talmud Eser Sefirot”: Therefore we must ask, why then, did the Kabbalists obligate each person to study the wisdom of Kabbalah? Indeed, there is a great thing in it, worthy of being publicized: There is a wonderful, invaluable remedy to those who engage in the wisdom of Kabbalah. Although they do not understand what they are learning, through the yearning and the great desire to understand what they are learning, they awaken upon themselves the Lights that surround their souls. Our desire should be not to understand, but to feel this inner spiritual picture. By that very desire we attract Light from there, which corrects us. And then we enter the sensation of this inner world. Question: There are states that all groups go through, including groups of children. We feel that we have attained a certain level of unity, and then our egoism grows and everything falls apart, and thus we lose confidence. How can we acquire it again? Answer: This is a good state. We are advancing on the spiritual path together and uniting in order to acquire the spiritual world together. In other words, we unite our egoistic forces intending to break into spirituality and reach the Creator. We think that this is our initiative, that we are leading. But then we begin revealing hatred, repulsion, and problems among us. That’s because we have to realize that we are incapable of bestowal, that we are egoists who do not wish to unite unless there is a goal standing before us that is clear to our egoism. When setting out to unite, we talked and thought about spirituality, and studied it at the lessons. That is how we “ruined” ourselves because we attracted Light from there directly into our egoistic breaking, and due to the imbalance, the difference of qualities between the two, the breaking naturally developed. We revealed it. That is when we have to understand that we have discovered the truth and have ascended from the material level to the level of the breaking. If now, at this level, we will begin uniting with each other by means of the same Light, then we will apply the method of correction and will reveal the spiritual reality inside the corrected Kelim. That is when we start making corrections, whereas until now there was simply nothing for us to correct because we united with our egoism, being happy at how much fun it was. Every person who reaches the breaking and acts against his egoism must unite with the friends despite the repulsion. This is possible to do only with the help of the upper Light. It separated me from others and now I must feel that it reunites me with them. As soon as it does this in the smallest degree, I will begin to feel the spiritual world. After all, the connection between us is already spirituality. Question: Where should my confidence about tomorrow come from: society or the Creator? Answer: Confidence comes and is revealed only in the connection between people. Material confidence is expressed in the material society, whereas spiritual confidence is revealed in spiritual society. Spiritual confidence does not mean that I do not need anything. It has a different meaning: I am sure that I won’t lack the forces to bestow to others and the Creator. My confidence is not aimed at myself, but at the goal. I am sure that the people around me will support me in this according to the principle of mutual guarantee. And what other confidence do I need from them if I am in the spiritual world? On the other hand, in this world I want to be confident that I will never have a lack of egoistic fulfillment. Question: Still, I can’t just restrict myself to spiritual confidence. Don’t I also need confidence on the material level? Answer: While you are in this world, you have to take care of its vital necessities. While being in society, you have to take care of it. No matter how high the society’s spiritual degree may be, as long as the material world has not disappeared from people’s perception, they have to take care of what they need today and tomorrow. They need goods and products, storehouses, and so on. Therefore, it is important to differentiate between material and spiritual confidence. In corporeality I care for myself, my relatives, and even all of humanity. But spiritual confidence lies higher: It is confidence in the fact that we are able to bestow as much as possible at every moment of our lives. Question: How can we acquire confidence on the material level, including the economic, medical, and social realms? Answer: These problems can only be solved by bestowal, with the help of the Light. If you want to be healthy and if you want to acquire immunity from the impending problems, then you have to live in a society that has the power of mutual guarantee. If would seem: What is so special about these friends? What do they have? Bank accounts in Switzerland? Their own companies? A successful business? Or maybe they are all doctors, lawyers, bankers, and big experts in general? The fact is that they are nothing of the sort. But if they have the right, good connection, then you cannot beat them. They have total confidence. They receive such a “charge” from above that no one can use them selfishly or succeed more than them. That’s because they have fulfillment, unlike everyone else. Confidence is expressed only inside unity. We even see this in our world: What is one person able to do? Even if you bring Schwarzenegger, and even if you have two people, or three, or a thousand, even if you dress them up in metal arms, will you be confident then? Today we do not have confidence in anything, including power. How many weapons can we keep producing? How much means do we have to protect ourselves? In the end, no matter how much we arm ourselves, this does not give us any confidence. The population only feels calmer. For example, in Israel the people are periodically given out gas masks, although I heard that this time people do not even want to receive them so much. Everyone is already tired of this. People need confidence of a different sort.